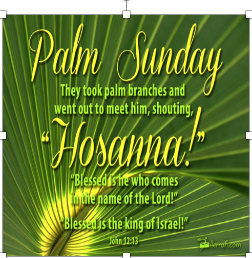 When Jesus triumphantly entered Jerusalem on the day that we now know as Palm Sunday, the people laid palms on the ground for him to walk on. One explanation for this is that, at that time, it was common practice to welcome home a king or war hero by laying out a path of branches much like we do today by rolling out the red carpet. This is an indication of the regard in which the people of Jerusalem held Jesus, the son of a common carpenter. How quickly things change, only a very short time later many of these same people were calling for Jesus to be crucified. 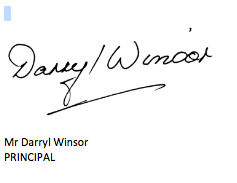 We can only surmise how could this happen, but, I feel, the fear of change and having the way that things had always been done challenged would have been a significant factor. Many would ask how people could even consider putting Jesus to death but when our normality is challenged many of us may be capable of things that we later regret. Let us pray that we may always remain open to new ideas and accepting of those who challenge us with them. On the First of November 1914 the first convoy ships set sail from Albany carrying Australian and New Zealand troops to the First World War. For many of these, Albany was the last they saw of Australia. Today we live in one of the safest and most prosperous places on earth and it is largely due to the sacrifices made by these men and the many men and women who followed in subsequent conflicts defending our country and our way of life. This morning we remembered those who have and those who currently serve in the military at our ANZAC Service co-ordinated by Miss Danielle Smith and Mr Adam Seers. The children were very respectful throughout the service which was highlighted by an address by Mrs Carley Chua (mother of Harry in Year 3 and Samuel in Year 5) which focused on both nursing during conflicts and in modern times. I think the children were particularly engrossed when she told them that, even though she had to clean up wee, poo and vomit as part of her job, she still loves her work and feels privileged to be a nurse. Thank you, Carley, for such a poignant address. 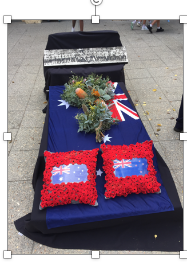 A wreath and posy prepared by my wife, Anne, were respectfully placed on the Australian flag alongside some cushions adorned with poppies that were hand-crocheted by Christian Rozario (Year 6), Mrs Mary Evangelista and Mrs Carmel Kempton. A number of children were dressed in their service uniforms which enhanced the dignity of the occasion. Thank you to everyone who contributed to our service this morning and made it a very moving occasion. 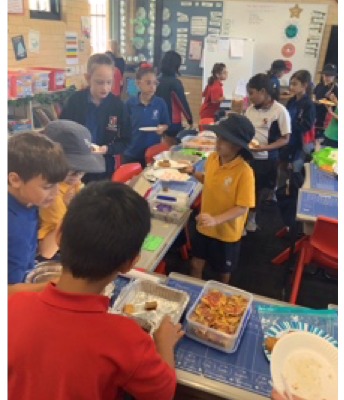 What an amazing range of food we had for lunch last Friday as we celebrated our many varied cultural backgrounds on Harmony Day. 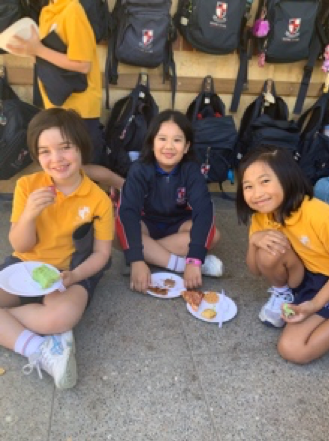 We have families from all over the globe at our school but we all share the same love of Australia and all of the wonderful opportunities that we have been given. 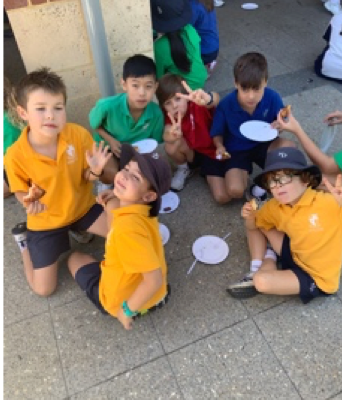 We all gathered on the school oval after Recess and spelt out just what we all want to experience. Thank you to Mr Arosha Goonawardena who took this amazing photo with his drone. 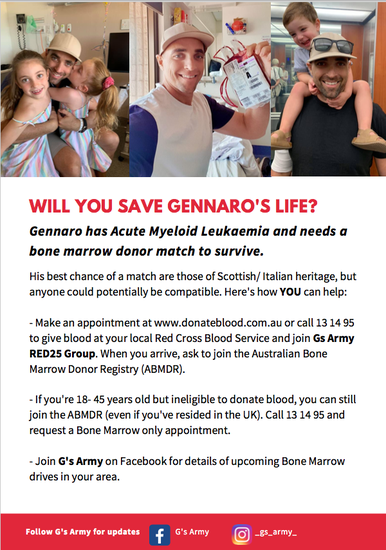 It is with great pleasure that I welcome Miss Emma Terranova to our staff. Emma joins our Kindergarten team as an Education Assistant in Mrs Dianna Panzich Sekulla’s class. We wish Emma much happiness and success at Notre Dame. 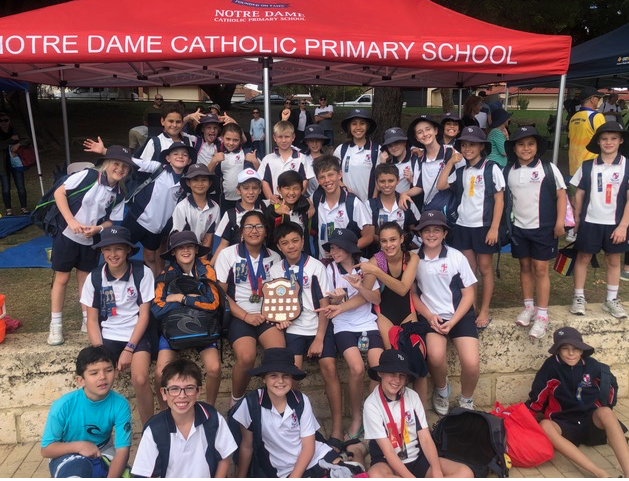 What an amazing effort by all of our swimmers at the Interschool Carnival last Thursday. For the second consecutive year we are the champion school by a very significant margin. Congratulations to all of the children for giving their best and achieving such an excellent result. 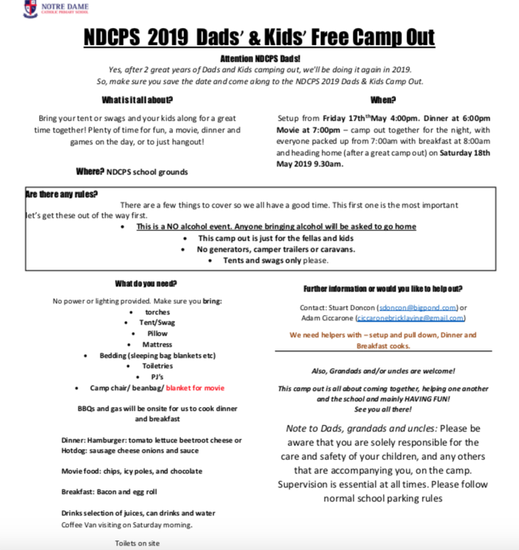 Mr Webb will elaborate upon the Carnival in his article further on in the newsletter. 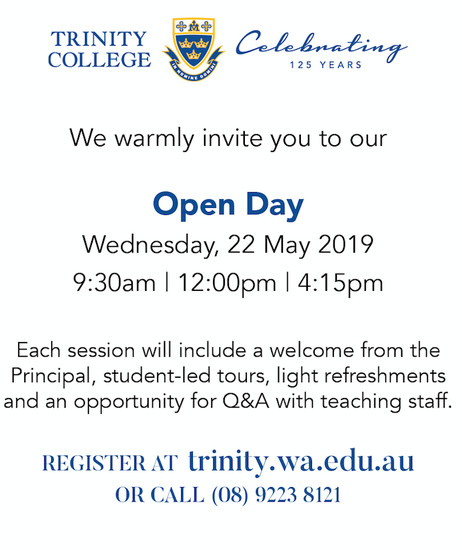 The school Leadership Team will be attending the Presentation Schools’ Conference in Brisbane during the first week of Term 2. 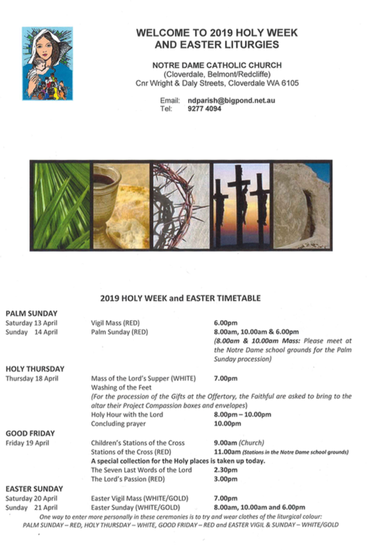 Mrs Linda Harland and Mrs Julie Carlton will be in charge during our absence. We started off this term focusing on Persuasive Writing. 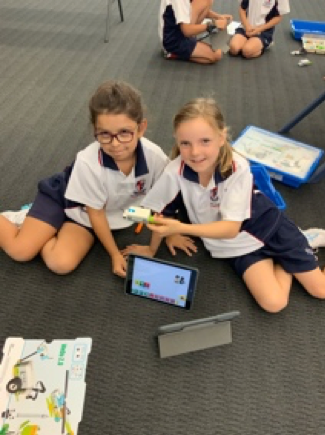 The students learnt the structure and features of persuasive texts and completed fabulous writing based on NAPLAN prompts. Our students can be very convincing! 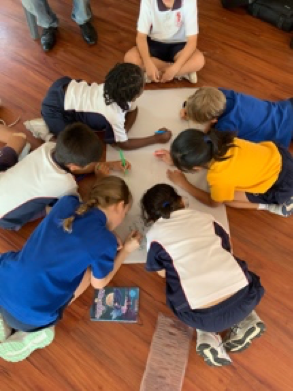 Throughout the second half of the term, we have been learning more about Narrative Writing. We are focusing on adding descriptive words and using engaging sentence starters to make our writing more exciting. 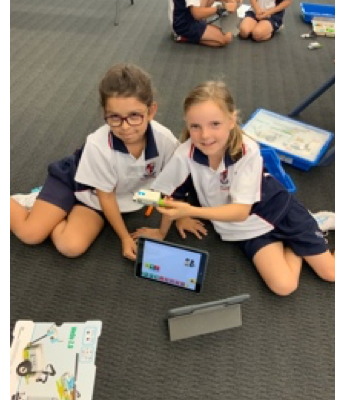 This term in Maths we have been learning strategies to assist us in solving addition and subtraction problems. We have been learning how to tell the time in hours and 5-minute intervals. Our Times Tables have been a huge focus and we have been playing games such as Tag and Buzz to make our learning fun! 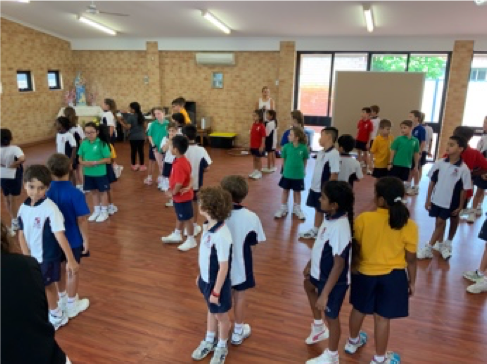 On 8th of March, both Year 3 Classes attended the Faith Retreat in preparation for the Sacrament of Reconciliation. It was a fun day filled with games and lots of learning about the importance of Reconciliation in bringing us closer to God. Some of the Year 3s made their First Reconciliation on the 28th of March. It was a beautiful ceremony and it was so nice to see the families coming together to support the students. 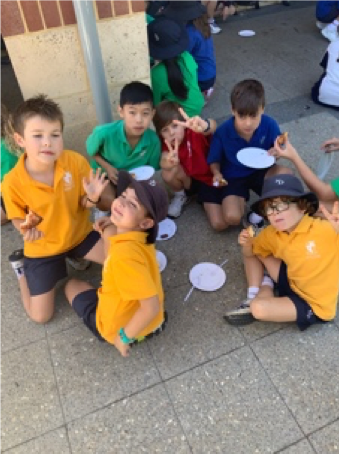 Harmony Day is a day where we come together to celebrate the unique and diverse cultures that make up our school. 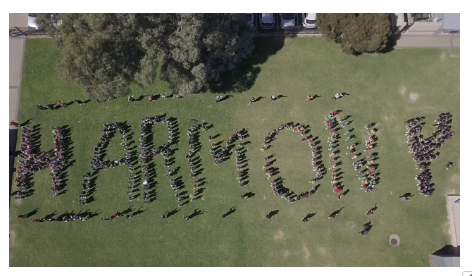 We celebrated with the whole school by creating the word Harmony with our bodies. 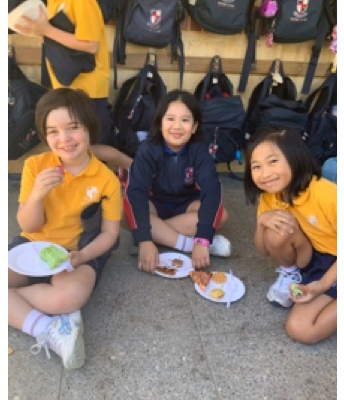 Our letter was the letter M.
We then returned to the classroom to enjoy a shared lunch. 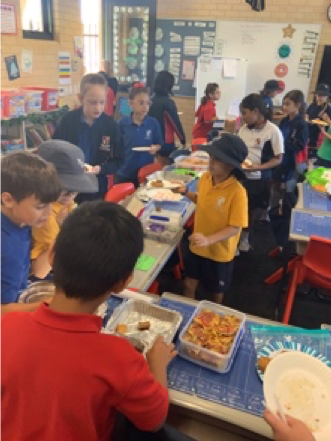 We ate dishes from many countries such as Ghana, Colombia , the Philippines, South Africa and we also enjoyed the famous Australian delicacy, the lamington. Thank you to the parents for bringing in and sharing a part of your wonderful culture with us! 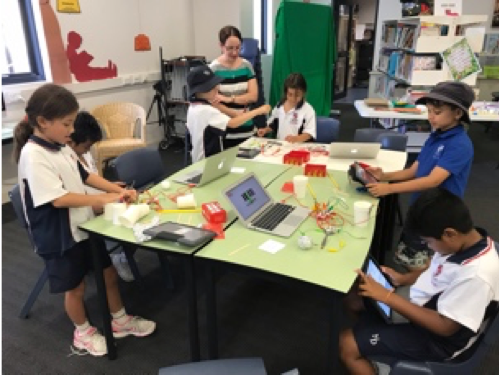 This term the Year 3 classes have been lucky enough to participate in Makerspace sessions for one hour every week. 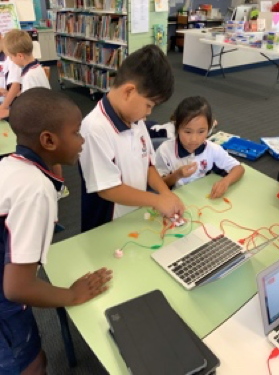 It is safe to say that Maker Space has been a huge hit! Last Thursday, selected students from Years 4-6 represented Notre Dame at the annual Interschool Swimming Carnival held at Aqualife Aquatic Centre. Students came into the day very excited and confident of backing up last years strong performance. 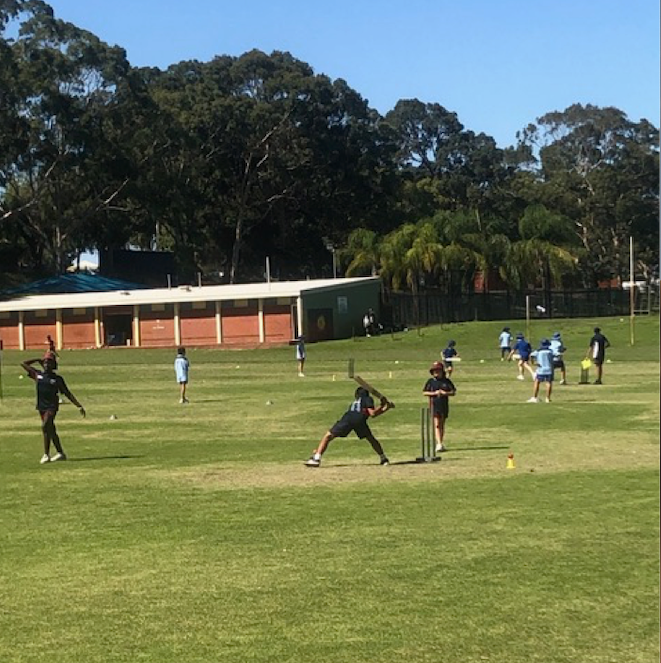 It is a great day for our students to showcase their skills against other like minded students trying to achieve their own personal goals as well as helping out their school. 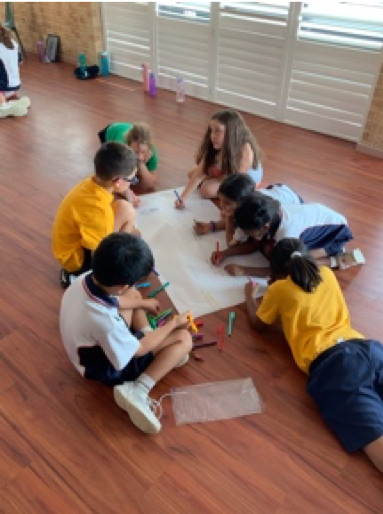 The Year 6 group came into the day well placed to be very consistent in their events, with most of the group being only 1-2 seconds apart in each division based on swimming carnival results. The day started off well with some great performances in the open butterfly events from our top Year 6 swimmers. 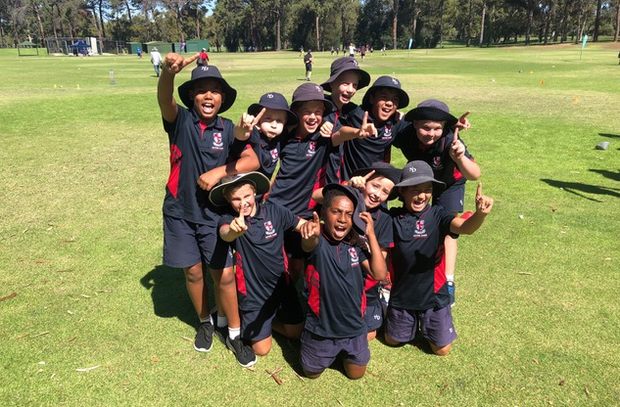 it was then time for our Year 4’s first taste at an Interschool senior carnival, with the boys showing some consistent places and the girls pushing for top positions. 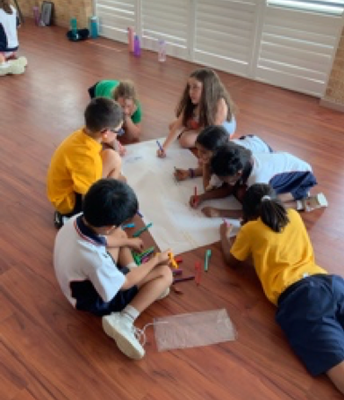 Our Year 5 group proved to be very consistent over the course of the day, with different swimmers in each of the events, which was great to see. The Year 6’s then came on and dominated the freestyle events with five 1st place wins in a row! By the end of the freestyle events, thanks to the fantastic start by the Year 6’s, Notre Dame was in 1st place by two points! The breaststroke events came next with our Year 5’s following the Year 6’s fantastic efforts in the freestyle with consistent top places. The Year 6’s then improved on their freestyle efforts with six 1st place wins in a row…I’m sure that has to be some kind of record ). 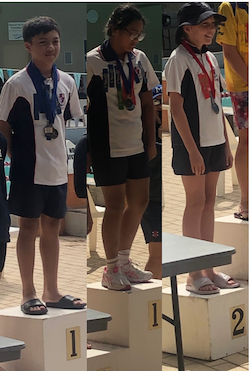 The Year 6’s then had to back up their efforts after a short break in the 50m medley relays and did not disappoint, with a dominant performance coming 1st again. The Year 4 girls showed how it is done in the backstroke, with great efforts across the day. 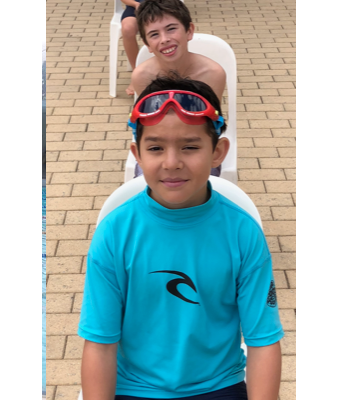 The Year 4 boys showed great determination in their backstroke relays, with some good technique on show. The Year 5’s again proved very consistent, with one 1st place and notable high positions. The Year 6’s again finished with all 6 competitors coming in 1st position! The day finished with some very exciting relays from our year groups. 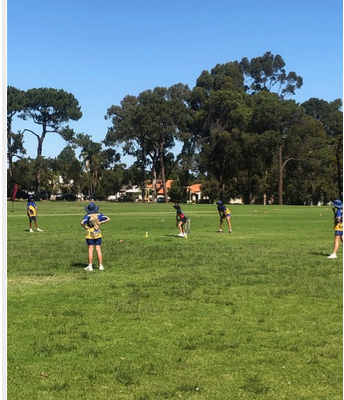 It was a great effort by our students on the day, showing great consistency, determination and sportsmanship throughout and always cheering on their teammates. It was pretty easy to see walking around that we were the loudest cheering school! Thank you to all the parents for coming down and supporting their children and the school. I would like to thank Miss Gollner, Miss Smith & Miss Juffermans for their help in Swim Squad training prior to the carnival. I would also like to thank Brother Stephen, Mrs Notte and Mrs Gilmour for their encouragement and work in certain roles at the carnival. If you haven’t figured it out by now, Notre Dame finished in 1st place! Well done to all the students on their efforts with training and on the day. There were some notable individual performances on the day which have been mentioned below. Well done Notre Dame! 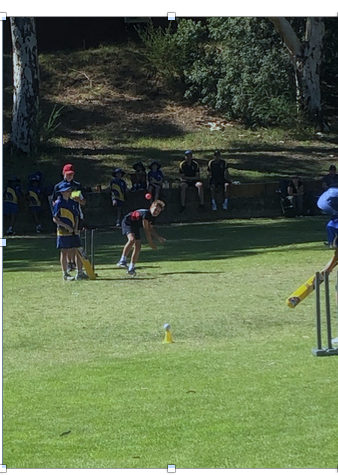 On Tuesday, selected Year 6 students represented Notre Dame at the Interschool T20 Cricket Carnival. 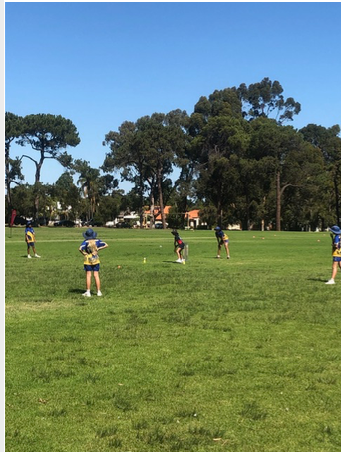 It was a great chance for the kids to enjoy some inclusive games of cricket that caters for all levels. 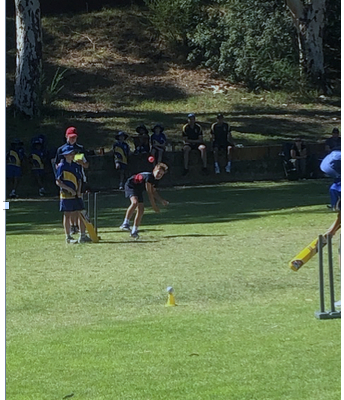 We had three teams represent the school - 1 boys team, 1 girls team and 1 mixed team. It was a beautiful day for cricket and all the students enjoyed the team environment and a chance to test their skills against our Interschool cluster schools. Well done to all students on their behaviour, sportsmanship and efforts throughout the day. 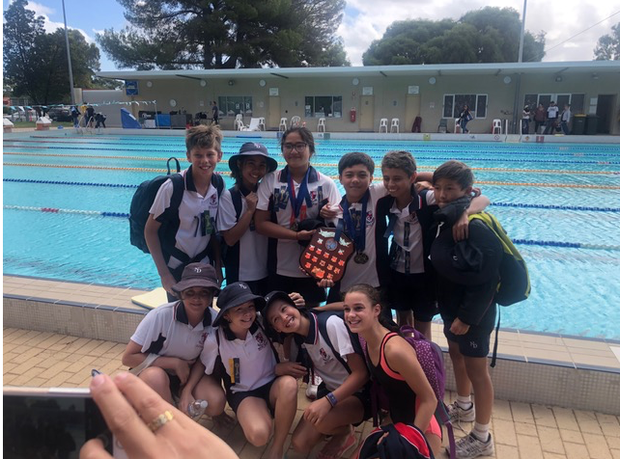 We had some great results with both our mixed and girls team finishing in 3rd place, and our boys team taking out 1st place. Well done to all students and special thanks to Mrs Hennessy and Mrs Davidson for their coaching expertise throughout the day. 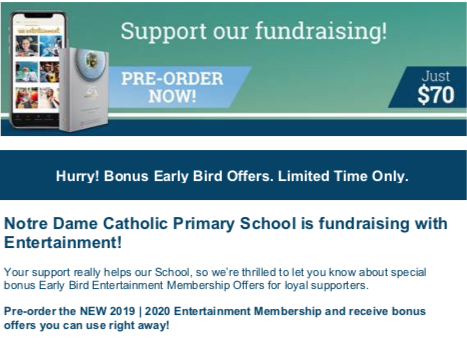 Well done Notre Dame! 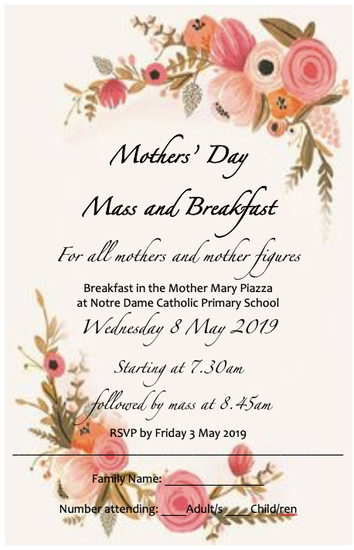 Please RSVP on the google form below. This will assist us with catering. 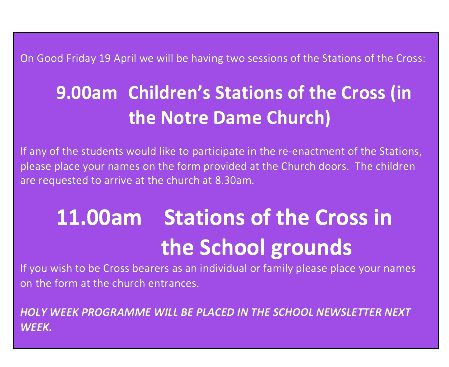 Raffle draw Friday 12 April after Merit Assembly.